Smelling the roses or more succinctly having “time out” was sort of what I was expecting after sailing across the Atlantic but no so! A couple of days in St Lucia to do the washing, make contact with the outside world, visit a local Friday night street party and take a whistle stop drive around the island in a hire car was all we had time for. Antigua was calling us for an engine and generator service. 4 days later we set off again with just 3 (Mike Roberts stayed with us until Antigua) via Martinique, the Isles de Saintes and Guadeloupe arriving just in time for Mike to catch his flight back to Melbourne (through Toronto, Vancouver and LA). We had a taster of the Carribean as we went, anchoring each night in a delightful harbour in time to have a swim before the sun went down! We didn’t go ashore – you need to complete immigration or “clear in” each time, which can be a very time consuming process. Then it was off again the next morning. We hope to retrace our steps on the way across to the Panama Canal and savour these and many other delights at a more leisurely pace! Antigua greeted us with the a Super Yacht expo just a stones throw from our Marina berth. If you were ever in doubt that such expensive, oversized boys toys ever existed then I am here to assure you that they certainly do. Google “Maltese Falcon” and you will get an idea of what I am referring to! Heads down and bums up was the motto of the next couple of days. Lindsay and Jules from Seapower Marine turned our home on the sea upside down and inside out (again) servicing our new VW marine engine (named Victor) and our Onan Generator (Oscar) and making sure that together they will see us safely back to Australia. 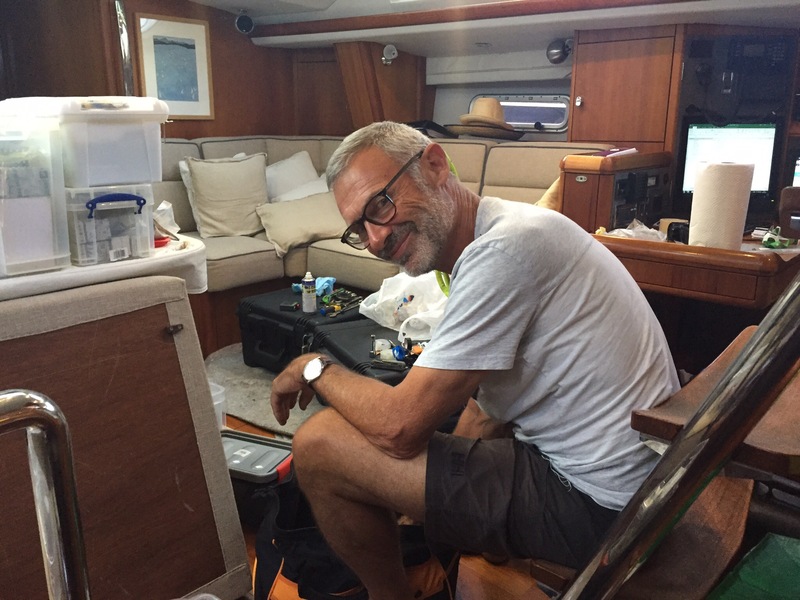 James was on a steep learning curve – on hands and knees in the engine room and turning himself inside out to get into very small spaces in the boat. Emily Clark – we should have got some Pilates exercise suggestions from you!! I vacuumed up after them with Wendy (my trusty wet and dry vacuum cleaner made by Wickes) and a Bucket (named Bucket) washed away the copious quantities of oil and grease that was swishing around in the bilge! Seriously though, it would be extremely difficult to find 2 nicer people who worked so hard in the heat for 2 full days than Lindsay and Jules. It was like watching a surgeon and his theatre sister assisting him on open heart surgery! On a more somber note – I have been touched by the poverty and hard times of the locals on some of the islands, particularly juxtaposed with the wealth of many tourists (cruise ships and yachts) that pass through them. Sadly, some have resorted to stealing from the visitors that come to visit and spend their money in these beautiful islands. One case closer to home, an Oyster crew member was beaten up and robbed by 4 locals who left him on the roadside. He crawled into a garage too frightened to come out until the sun was up. We also met a young Chinese girl who had been robbed of her handbag behind the restaurant in which we had just dined and just a short distance from her hotel. These both occurred within 24 hours of each other. Word on the street is – don’t go walking at night alone! The cleaning, sorting, re-packing and logging of spare parts has started again in earnest. In between we catch up with friends (also OWR participants) over a beer, wine or G&T, try and get some exercise (although I have now realised that living on a boat is an exercise in itself), visit the hairdresser (desperation), re-provision and chat with the many fascinating people that Antigua seems to present. Top of the list though is the growing excitement for the weekend – Sal arrives on Friday and Will on Saturday and an added bonus of Jude and Skroo Turner for a couple of days as well….